IT Carlow held Institutional Strategic Analysis Workshop with NStEP. Institute of Technology Carlow Institutional Strategic Analysis Workshop was held on the 6th February. The workshop is carried out as part of the National Student Engagement Programme (NStEP) and facilitated by NStEP project manager Cat O’Driscoll and Simon Varwell from the Student Partnerships in Quality Scotland(sparqs). NStEP is the National Student Engagement Programme is a collaborative initiative to enhance student engagement across the Irish higher education system. NSTEP is supported by USI, HEA and QQI. One of the NStEP objectives is to build institutional capacity to provide high quality opportunities for students to engage with their higher education institution. 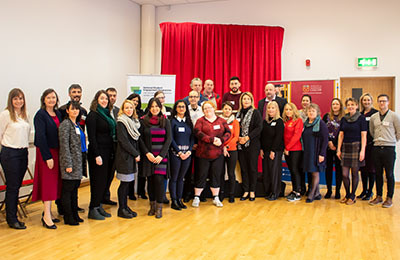 This workshop brings students representatives across all Institute of Technology Carlow disciplines and campuses together with staff representatives, across Senior Management, Academic Staff and Professional Support Staff. Together, in this interactive, action planning space, discussion centred around where Institute of Technology Carlow is regarding student engagement now and where it can be in the future. Each of the representatives are invited to share their input within the workshop with practical suggestions and advice. In his opening address, David Denieffe, VP for Academic Affairs and Registrar, welcomed the participants and was delighted to see representatives from across Institute of Technology Carlow disciplines and campuses. He noted that this was a great forum to bring together ideas and actions to develop the partnership approach to student engagement. Richard Morrell, President of Students Union spoke to attendees about the work that has been carried out by representatives within the Institute and expressed his delight to hear that those representatives held the same view as staff and students in the Students Union on how important it is to have student leaders. Richard thanked those in the Institute for the amount of work that was carried out on the projects to date. This was an active workshop where the participants discussed the elements of engagement and where improvements can be made in the future. Institute of Technology Carlow leads on one of the national NStEP projects. This project on ‘Student Feedback Opportunities, Data and Follow Up’ will produce national guidelines and best practice case studies on providing opportunities for students to effectively engage and giving them feedback on how their engagement helped. This project, along with the four other national projects and the Student Class Representative Training Programme, will share their outputs at the National NStEP conference in the Department of Education on Tuesday March 12th.